Well known for the splendid and magnificent waterfalls, Bhedaghat in Madhya Pradesh is famous for its striking marble rocks which are 100 feet high and located on either sides of the river Narmada. The place looks more beautiful when sunlight falls on these marble white rocks and contrives shadow on the waters. These white rocks with black and dark green volcanic seams look splendid and create a magical effect on moonlit nights. 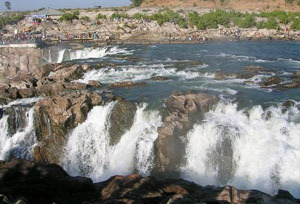 The Narmada River flows gently through these lofty marble rocks and a little distance away, the water becomes roiled as it plunges in a mighty waterfall famous as Dhuandhar. The waterfalls and the breach of the water volume at the top offer an excellent vision of Nature's power set free. Nature seekers can also enjoy boat ride activities from November to May as boating during moonlit night through the marble rocks would surely give you a memorable experience. A rope way or cable car is also available here that takes through the gorge making an unforgettable experience of exploring the marvel of nature and striking sight. Visit Bhedaghat to enjoy its bewitching scenic beauty and cascading waterfalls. One of the famous tourist attractions in Bhedaghat called 'Chausath Yogini Temple' is also a wonderful sacred place for devotees, which is an abode of Goddess Durga. It includes carvings 64 yoginis (a female attendant of the mother goddess). The temple itself is a lovely attraction, which is exclusively planned and has decorative collectibles of deities of Kalchuri period. So, if you are bored from you busy lifestyle, then take a break and go for a holiday tour to Bhedaghat in Madhya Pradesh. No doubt, the magic of the place will simply leave you needing for more. The Marble Rocks of this place have been known as one of the thousand places that one must explore once. Come and explore the most famous marble rocks of Bhedaghat which looks very beautiful on a full-moon night. Viewing Marble Rocks with black and dark green volcanic seams give a unique experience and therefore its worth to visit while you’re on a Bhedaghat tour. You can board a rowing boat and enjoy a short boat tour and the view of glistening marble rocks. 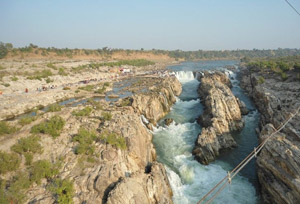 Lies across the river Narmada, these rocks have been emerged as a famous tourist destination. Tourists can enjoy boating on the Narmada River and experience the magnetizing natural beauty. The guide narrating a story of love in a comic style is one of the most interesting parts which add more fun to your boat ride on Narmada through Marble Rocks. At some point, you may come across the Bandar Kodini Point where the cliffs come closer and from there monkeys are capable enough to jump across. Another rock formation like a deer (Miran Kunch), Hanthi ka Paon (Elephant Foot), the horns of a cow and the Horse's footprints that are also worth to visit once. 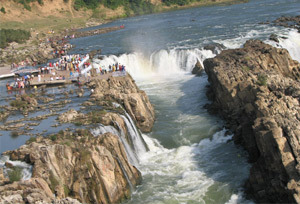 Another major tourist attraction to explore here is “Dhuandhar Falls” (smoke cascade), which enthrals every tourist with its breathtaking views. You’ll get thrilled viewing the Narmada River, which passes through narrow passage and makes fog and sound. So, get shuddered by viewing the power of the waterfall and thundering sounds of the falls. If you seeking for religious spot in Bhedaghat, then visit Chausat Yogini Temple which stands on the hillock, overlooking the exhilarating view of marble rocks and Dhuandhar Waterfall. On arrival at Bhedaghat main road, you’ll come across several shops from where you can buy marble handicrafts and religious icons. Where to Stay Tourists can enjoy a comfortable accommodation near Bhedaghat as there are few luxury hotels that offer comfortable stay with luxury facilities. A number of hotels, lodges, and guesthouses are there in the city that caters to the needs of all kinds of visitors. Shopping Bhedaghat is very famous for marble artefacts and you can find a local market 'The Soapstone', which is outside the Marble Rocks and very famous in making handicraft items like lingams, ashtrays, gods and goddesses, etc. So, if you are here do buy these handicraft items for your memory. By Road: Ranjhi Bus Stand (27.9 Km) is the nearest route to reach the destination. Best Time to Visit: October to April is the best time to visit here as during this time, a large number of tourists flock here to experience the pleasant views of the Marble Rocks through boating.